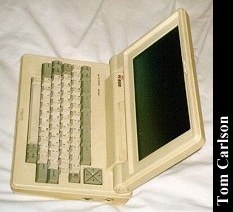 If you could improve the Tandy Model 100, what would you do? I would like a full screen, better cursor keys, a real word processor, some sort of spreadsheet, a better telecom program, and a real operating system that would still let me just choose a file name and have it load it up in the correct application. If I had all this, I would have an NEC PC-8500. The screen is a full 80 x 25 characters. It's also razor shart for a passive LCD. The screen pivots to any angle, and stays there once set. 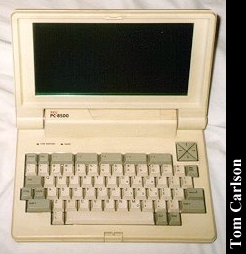 It has the same great cursor keys as the Daewoo IQ-1000, showing their common Korean heritage. 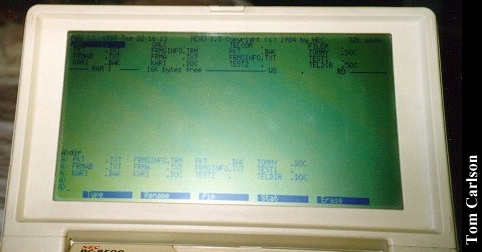 Burned into ROM is a version of WordStar, along with nice spreadsheet and telecom programs. (The telecom program even does X-modem.) All this and the darn thing runs CP/M! It has 64K RAM, 32K for CP/M and 32K for a RAMdisk. And if you don't like CP/M (seek help, now) you can still just cursor to the file name and hit enter, just like on a Model 100. The battery life is shorter, 20 hours vs. 40 hours for a Model 100. It uses 4 C-cell batteries, rather than the AA size in the Model 100. It's about twice as thick. Side view, showing the power switch and contrast knob. 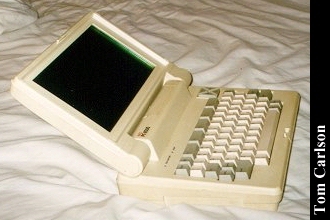 Other side view, showing the cartridge port for connecting a floppy drive or 1200 baud modem. 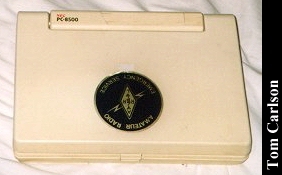 Front view of the PC-8500. Screen shot. The RAMdisk directory is at the top. The command line is at the bottom. 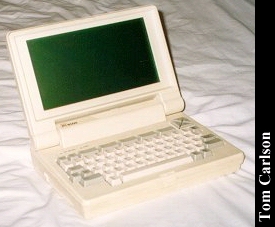 Rear view, showing modem and printer ports. The battery cover is removed, thus showing off two of the four C cells that power it. Top view with cover closed. 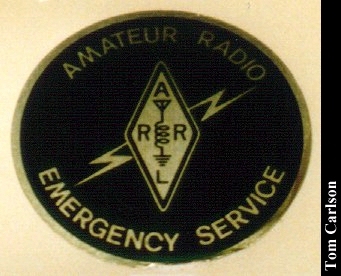 Close up of the Amateur Radio Emergency Service logo. (Not standard equipment.) Until recently, this laptop saw regular use. 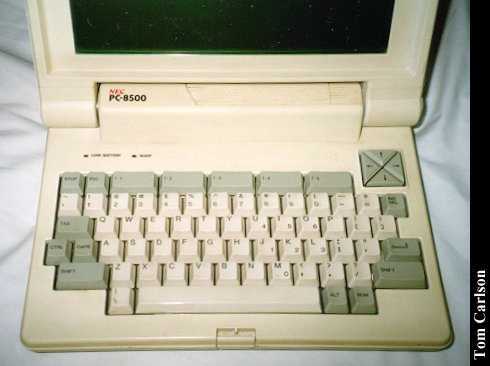 Click here to view all comments for the NEC PC-8500 and to leave your own.